I totally understand if winter travel isn’t really your thing, though. After all, in most places, visiting in winter just means that the weather is miserable and everything shut down for the season. Not so in the Arctic, however! Winter (as in: December to March) is when many places finally come alive again after a quiet summer, as visitors flock there to go skiing or see the Northern Lights for the first time. This article, thus, aims to present 9 unique choices of accommodation throughout the Arctic that’ll provide an unforgettable winter wonderland experience! I had the pleasure to stay at the Wilderness Hotel Kuusamo back in January and what can I say, this place was just absolutely magical! Situated in the middle of nowhere in North-East Finland, just a couple of kilometres from the Russian border, Isokenkäisten Klubi (“Club of the Big-Shoe People“ as this place is called in Finnish) offers a lodge hotel and several holiday cabins in a magical forest, right next to a frozen lake. The place is run by the two sisters Katja Vira and Sirpa Kämäräinen who are running Isokenkäisten Klubi in the second generation. They left the cabins and lodge in their original, traditional Finnish, state and ensure that you will not only experience Finnish culture through the landscape that surrounds you, but also through traditional Finnish cuisine, such as reindeer meat. I could have stayed an entire week at their estate, just enjoying all the snow and beautiful scenery, going on a snowshoe hike through the forest and maybe giving ice-fishing another (probably unsuccessful) attempt. In a nutshell, if you’re looking for a winter getaway away from the beaten track, Isokenkäisten Klubi is one of the best all-around choices that are currently available in the Arctic! Fly to Kuusamo (for example, from Helsinki with FinnAir, from Frankfurt with Lufthansa, or from London, Birmingham and Manchester with TUI Airways). The hotel is located a 40-min ride from the airport (transfers are available). You can book hotel rooms at the Wilderness Hotel here and the Wilderness Chalets here. You’ve probably heard about the Icehotel Sweden before and might think that sleeping in, what basically is a giant freezer, isn’t for you. The good news is, that the Icehotel Sweden also offers heated cabins right next to their ice igloos! I haven’t personally stayed at the Icehotel and was only there on a day trip from Kiruna, but I totally fell in love with this place! Yes, it’s certainly not off the beaten track and can become a little crowded with visitors during the day. However, the surroundings at the frozen Torne river (where they take the ice for the igloos from) are absolutely stunning and very peaceful. Staying at the Icehotel in Jukkasjärvi doesn’t exactly make for a budget holiday but it certainly makes for an unforgettable one! Go dog-sledding during the day and have some drinks at the Icebar in the evening, before warming up again in the lounge of the hotel or trying traditional Swedish cuisine at the restaurant. And who knows, maybe the Northern Lights will appear once you head back to your cabin? Fly to Kiruna with Norwegian or SAS from Stockholm, or take the night train from Stockholm. A shuttle service/transfer to the Icehotel is available. You can book both, cold and warm rooms, at the Icehotel Sweden here. Would you like to head to Tromsø to experience the Northern Lights and go whale-watching? You might have already looked into accommodation in the city but are still searching for a cosy cabin that you can rent without having to rent a car? In that case, Tromsø Lodge & Camping is perfect for you! The campsite is situated on the mainland site of Tromsø, only 3.5 km (and thus, only a mere 5-10 mins by bus) from the city centre, yet in an absolutely peaceful location in Tromsdalen valley. I had the pleasure of staying in one of their beautiful cabins for a weekend back in 2016 and felt very refreshed and recharged afterwards! You have the choice between small and basic cabins without en-suite bathroom (there are toilets and showers in the reception building) and spacious and more luxurious cabins with space for the whole family, as well as kitchen and bathroom. Whether you’re on a budget or would like to splurge a little, while staying out in the wild but still having easy access to the city without a rental car, Tromsø Lodge & Camping is the perfect choice if you’re looking for accommodation that has it all! I even got to see the Northern Lights above the campsite one night and there’s an ice-skating rink next door, where you can also rent skates - what more could you possibly need? 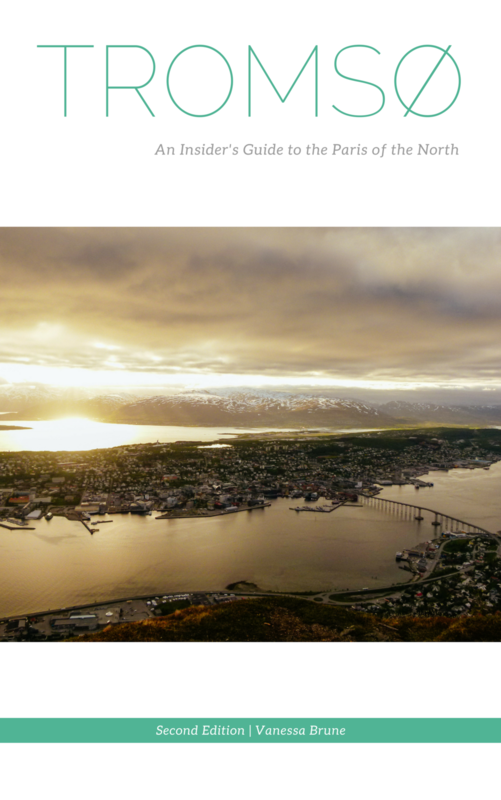 Fly to Tromsø from, for example Oslo, Copenhagen, Frankfurt or London with Norwegian, SAS and Lufthansa. You can take the bus to get from the airport to the campsite (though, you'd have to walk ca. 750m from the bus stop to the camp), but a shuttle bus can also be booked if you're travelling in a group of 5 or more. You can find an overview of all cabins and current rates of Tromsø Lodge and Camping here. Sweden has its ice igloo in Jukkasjärvi and now Tromsø has followed this example and established their own Icehotel in the Lyngen Alps, called Tromsø Ice Domes. Originally, they just started out with an icebar and show rooms but the demand to actually stay there was high, so you can now also book a room in their 600m² ice dome out in Tamok valley (approx. a 1 1/2-hour drive from Tromsø). During the day, you can go dog-sledding, snowshoeing, snowmobiling or even try a sightseeing tour by helicopter, while the evening includes dinner at the campfire, followed by drinks at the icebar, and hopefully a display of the Northern Lights - in short: a proper winter adventure! You can get to the Ice Domes either by rental car or shuttle bus provided by the hotel. You can read more and find current rates of Tromsø Ice Domes via Airbnb. New to Airbnb? Sign up for Airbnb with this link and receive 350 NOK in travel credit as a gift from me! Are you dreaming of sleeping in a tree house one day? I certainly am and while the Arctic TreeHouse Hotel doesn’t actually offer traditional tree houses, but “only” cabins in the woods, this hotel is pretty much on top of my bucket list! Situated in Rovaniemi, Finnish Lapland, these scenic cabins seem to make for the ultimate winter vacation chilling in front of the fire and reading a book during the day and hopefully seeing the Northern Lights at night! The hotel has all amenities you could possibly wish for, from a concierge service to a vegan and gluten-free breakfast selection. Granted, staying here is everything but particularly cheap, but personally, I think it’d be worth splurging a little for a magical view like that! The hotel is situated 3km from Rovaniemi Airport (shuttle service available), which you can easily reach with, for example FinnAir and Norwegian from Helsinki, or with Norwegian (and several other charter flights) from London and other places in the UK and Ireland. You can read more and find current rates of Arctic TreeHouse Hotel here. Just half an hour’s drive from Rovaniemi is another bucket list accommodation for you: the Arctic Glass Igloos! This village of tiny cabins with a glass roof should hopefully make your dreams of seeing the Northern Lights come true (however, due to Rovaniemi’s southern location in the Arctic, I would recommend you to stay at least 4 nights to increase your chances of actually seeing them). The glass igloos come with an aurora alarm, though, so that there’s absolutely no chance for you to miss the Northern Lights when they’re actually visible! During the day, you can go for a snowshoe hike, explore the nearby snowhotel (yes, another one!) or spend some time in the hot tub. There’s also an on-site restaurant serving traditional Finnish cuisine - what more can you want? The glass igloos are situated a 30min drive from Rovaniemi and a transfer from Rovaniemi Airport can be arranged. You can read more and find current rates of Arctic Glass Igloos here. If you’re a regular reader of this blog, you know that I’m madly in love with Greenland! I was fortunate enough to spend a week in the country’s capital Nuuk in order to do some research for my MA thesis. However, one of my biggest regrets I have about this trip is that I didn’t explore more of the country - and that I didn’t go on that (very expensive, but still) boat trip to the Icefjord to see real icebergs. I’m planning on returning to Greenland one day and I would absolutely love to head to Ilulissat then and stay at Hotel Arctic. This hotel provides rooms with a view of the ocean and icebergs floating by, but, more importantly, it also provides private aluminium igloos with a view that seem like an absolute dream! The hotel is actually the most northern 4-star hotel of the world, so no matter whether you opt for staying in the igloos or the hotel rooms, staying here seems to guarantee you an unforgettable experience! In order to visit Ilulissat, you'd either have to fly to Copenhagen and then board the Air Greenland flight to Ilulissat (with a stopover in Kangerlussuaq) or fly into Reykjavik and take the direct plane from there (however, this connection only runs during the summer). You can read more and find current rates of Hotel Arctic here. Pretty remote but not as much as Greenland, is Norway’s most eastern town, Kirkenes. Situated at the border with Russia, Kirkenes is mostly known for being the first (and last) port of the Hurtigruten cruises that run along the coast of Norway up to Bergen. The town has in recent years, however, started to focus on making tourists stay for more than just a couple of hours, though, so they’ve established the Snowhotel Kirkenes! Similar to the Icehotel Sweden, the snowhotel in Kirkenes also offers “cold” and “warm” rooms, meaning that you can choose between staying at their actual snowhotel or at the heated wooden cabins. As goes for most of the places mentioned in this article, you can choose to go dog-sledding during the day and will have the chance to experience the Northern Lights at night - traditional Norwegian dinner included! You can easily reach Kirkenes by plane from Oslo (with Norwegian or SAS) or Tromsø (with Widerøe). You can also take the Hurtigruten cruise from any port in Western/Northern Norway to get to Kirkenes. A shuttle service from the port and airport to the snowhotel is available. You can read more and find current rates of the Snowhotel Kirkenes here. I’ve traveled through Northern Norway with Hurtigruten 3 times now and would hop onboard one of their ships again in a heartbeat - even though I do suffer from sea-sickness! The cruise is called “the most beautiful sea voyage of the world” for a reason, after all! Within 12 days, you get to admire the Norwegian coast from Bergen in the south to Kirkenes in the far north - or you can just go for a cruise in Northern Norway only, for example from Kirkenes to the Lofoten Islands! Granted, Hurtigruten doesn’t make the port-to-port option easy for non-Norwegian travellers - in order to book, you have to call their customer service as you can only book these kinds of trips online on the Norwegian homepage - but it’s a great way to combine a cruise with a road trip in Norway and so worth the extra hassle! You can start your Hurtigruten adventure in Bergen or Kirkenes, or any other port at the coast of Norway. Chances are that you'll have to fly into Oslo first and then change planes there. You can read more about the different Hurtigruten voyages and ships, as well as find current rates here. Where would you most like to stay? Let me know in a comment below and don’t forget using the #nordicinsider on Instagram when sharing your travel memories!